Energy efficient, long lasting, LED advanced light GU 10 requires just 7 watts to match the light output of conventional 40 watt MR bulbs. 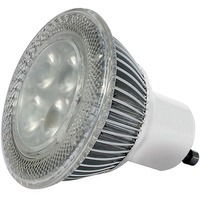 Featuring proprietary CrimpFin Heatsink Design, dimmable light lasts up to 50,000 hours. It is ideal for a wide range of commercial, retail and residential fixtures with GU 10 sockets. Design also includes 415 lumens, 2700K color, 25 degree beam and no UV or IR radiation.